When processing a gift batch, the first step is to set new gift batch presets to save time while entering information about individual gift items. The presets allow you to enter information that is consistent for all items ahead of time, and hide unneeded fields on the gift batch pages, which makes it easier to see what information is necessary and navigate the page using the “Tab" button. Your presets can be adjusted after opening a gift batch, and adjustments will impact all of the gift items you enter after the changes are made, but to save time we recommend avoiding editing your presets when possible. Once your batch presets have been created and you are ready to enter information for each gift item, click on the “Gift Batch" tab. In the gift batch tab, click the “New" button to create a new gift batch using any batch presets you have saved. The gift batch must have a name and opening date. The opening date will default to the current date. Information about the number and amount of gifts to process can be entered. When the gift batch is closed the summary will be compared to the items you enter, and the system will alert you to any differences. You can edit the summary information later if you make a mistake or add items, but when you commit (close) the batch, the summary must match the total of all gift items. Once you’ve filled in at least the required information (marked with red bars) you can save the gift batch. Your newly created gift batch will show the batch name and summary information, but there won’t be any gift items in the batch. You can now add a New Batch Item to process the first gift in the group. If the gift item was given by an individual or organization already saved in Causeview, the application can automatically enter the constituent’s information and connect the new gift to that constituent in Causeview. 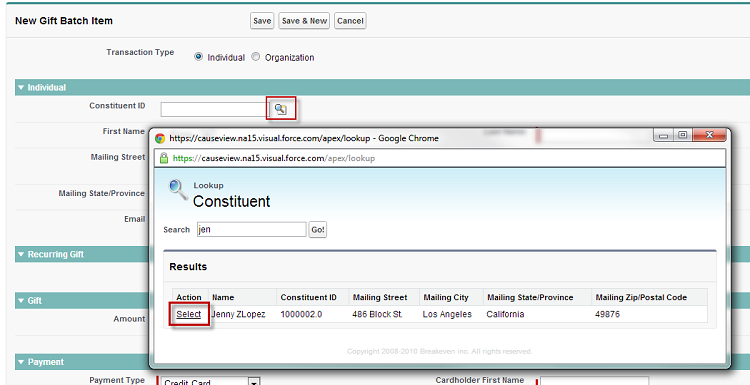 Click on the magnifying glass lookup tool next to “Constituent ID" to search for the individual or organization. It is important to search for an existing constituent for every gift item, because Causeview will create a new individual or organization for any gift item with a blank “Constituent ID" field, even if the contact information matches someone saved in the application. If the constituent is already saved in Causeview simply click “Select". Causeview will find the constituent and automatically fill the form with their information from the individual’s or organization’s detail page. If an individual saved in Causeview has an existing pledge where the full amount of the pledge has not been paid, an alert will pop up to let you know. If the gift item you are entering is not related to the pledge you can ignore the message and continue as usual. If, however, the gift item is a payment toward the pledge total, you can click on the pledge number to open the pledge in a new window and add a new payment. Once you have finished entering the pledge payment, you can close the pledge window or tab, and return to your gift batch. Remember that the gift should only be saved in Causeview once, either as a pledge payment or a gift batch item, but not both. 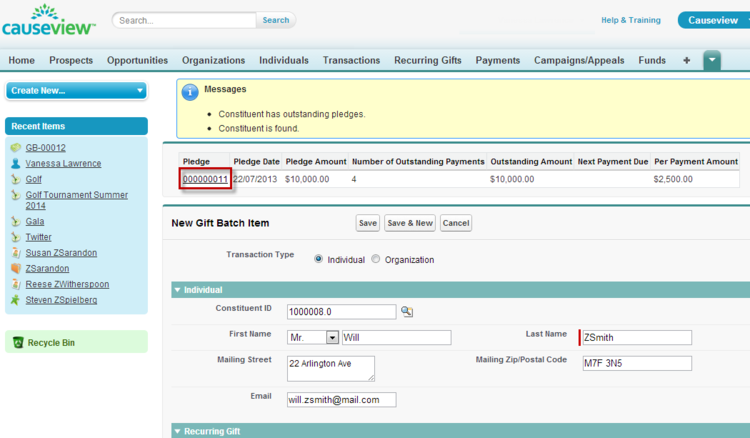 Be sure to adjust your gift batch summary so that the pledge payment isn’t included. If the constituent is not already saved in Causeview, enter all of the information you have and a new individual or organization will be created when you save the gift item. Any contact information you enter will be carried over to the constituent’s detail page. 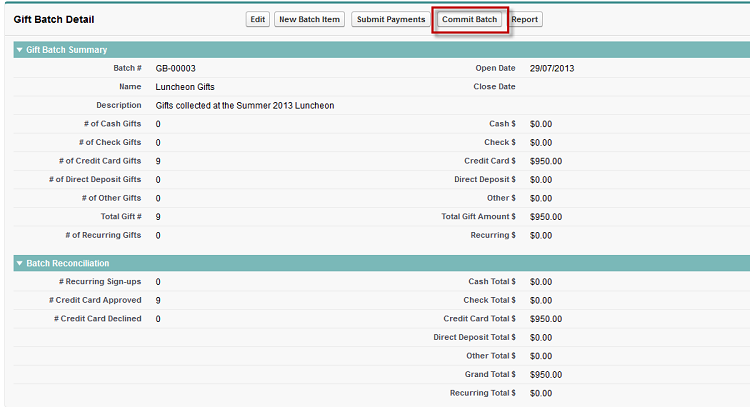 Fill in any required gift and payment information that wasn’t included in your gift batch presets. For example, in a credit card transaction the card number and expiry date must be entered for each gift item. If you have processed a credit card payment before entering your gift batch into Causeview, make sure to pick the payment type “Credit Card - Offline", as Causeview will charge credit cards in real time when payments are submitted. When entering any gift amounts, be careful to use only numbers, with no punctuation - “1000" rather than “1,000". In the gift batch presets only one allocation can be specified, but within each new item additional allocations can be added. If your allocation has been set in your gift batch presets the new allocation will be a duplication of the saved information, and can only be edited if you did not check the “read only" and “hidden" boxes. If you did not check those boxes for the allocation, the “+ Add" button will allow you to add additional allocations. When entering the allocation amount, be careful again to use only numbers, with no punctuation - “1000" rather than “1,000". Once you have filled in all the information about the gift item you can “Save" the gift. Continue creating a new item for each gift in the batch. As a security measure, credit card information you have entered and saved for gift items will be cleared after a scheduled period of time (usually two hours), or if you move to a different page within Causeview. If you need more time to enter your gift items, or if you need to move away from the gift batch before all of the gift items are saved, submit the payments using the “Submit Payments" button in the gift batch page. You can safely re-submit the payments after adding new gifts at a later point. Causeview will not double charge credit cards. Once all of your gift items are entered you will notice that the “approved amount" for each item is set to $0.00. 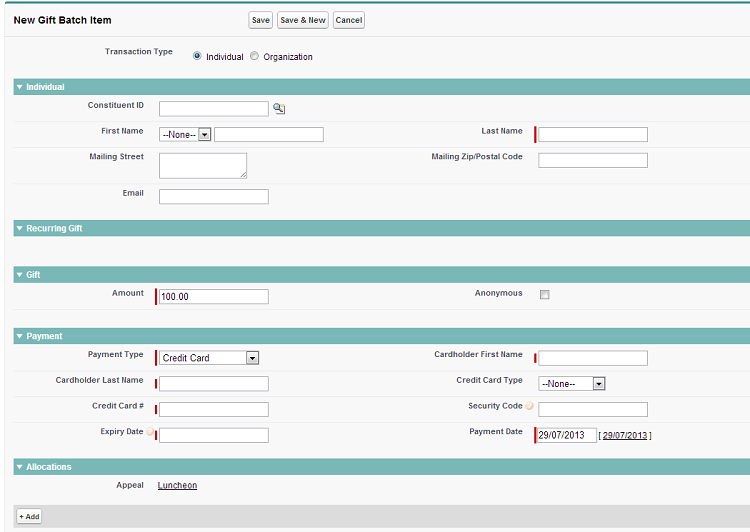 The next step is to process payments for all of the gifts by clicking on “Submit Payments". When you submit payments Causeview will save a payment for each gift item and, if the payment type is “Credit Card", it will process a transaction with your payment gateway online. Causeview will show a summary of how many credit card transactions are going to be made, to remind you that the cards are charged in real time. Remember that if you moved away from the gift batch to a different page before submitting the payments, any credit card information you entered will have been cleared for security reasons. After the payments have been correctly submitted, the items will update based on the approval information from the transaction processing. The payment submission process will be complete when all of your gift items are entered and the payments are approved. Once your gift items have all been entered and the payments for all items have been submitted and processed, the batch is complete. To close the gift batch the totals of all gift items must exactly match the batch summary. If any discrepancies exist, use the “Edit" function to adjust your summary of the gift batch. To save and close the gift batch, click on the “Commit Batch" button. Causeview will remind you that you cannot make edits to your gift batch after closing it. If you find you have more gift items to enter after committing the batch, you will have to create a new gift batch. After committing a gift batch, a “Close Date" will appear on the gift batch detail page, and your only option to interact with the batch will be to create a summary report based on the batch.